I responded to Maury’s annotated bibliography of VanKooten’s “Toward a Rhetorically Sensitive Assessment Model for New Media Composition,” and I also responded to Amy’s annotated bibliography of Bourelle’s et al. “Assessing Learning in Redesigned Online First-year Composition Courses.” I appreciated Maury’s conclusion that the model VanKooten offers is plausible because I trust her academic, pedagogical, and professional chops. I appreciated Amy’s intent focus on networking as it related to her chapter because I find her insights about connections among ideas enlightening, sometimes even intimidating, in their complexity and depth. I also wonder if Amy might have politely glossed over the fact that the authors had precious few assessments to offer (in a chapter titled “Assessing Learning…”) of their shift to entirely online composition courses! In each of my responses I noted my perception that their summaries touched on the practical and pragmatic. Part of my learning curve in this PhD program is the practical applicability of what I learn to what I do. And I don’t refer only to teaching, which I’ve only ever done at the college level in a contingent capacity over and above my full time profession as an online content manager (and sometimes developer) and marketer. Granted, these two chapters focus more specifically on composition pedagogy rather than web development, professional communications, or marketing, but they are part and parcel of a clearly pragmatic theme running through the ODU English PhD program. I am grateful for this focus, as I fully expected to find little of the coursework, reading, or writing applicable to my real world of composition and research pedagogy or professional communications. I am a product of undergraduate and graduate programs focused solely on literary and critical theory with no attempt at application (beyond the literary text) or pragmatism. As a result, I am refreshed and encouraged by the focus on pragmatism in the midst of grounding ourselves in theory. 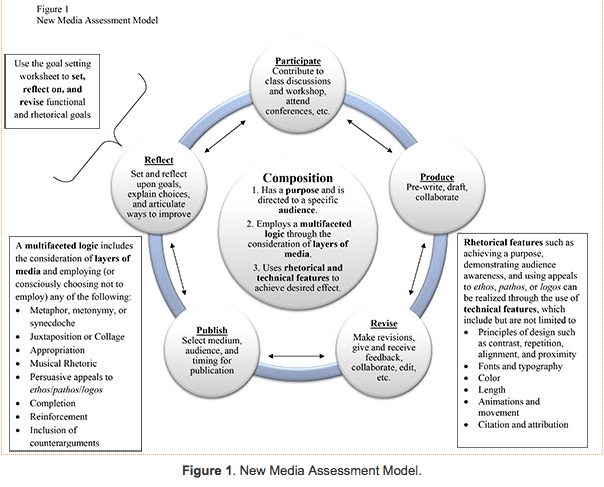 Crystal Van Kooten’s model of New Media assessment of multi-modal compositions. Courtesy ‘Live Action Network Theory‘ by Maury Brown. 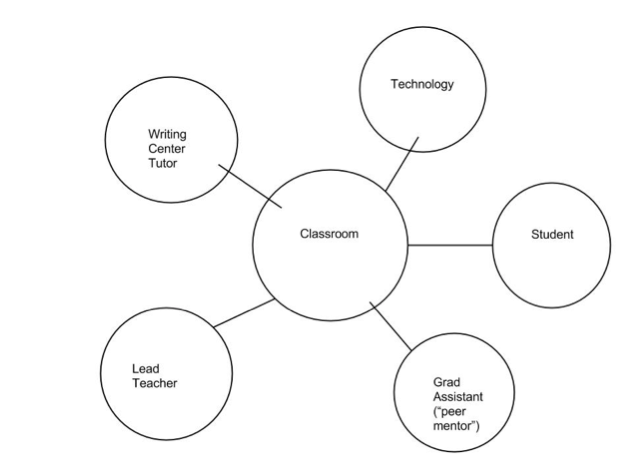 Classroom Network Representation based on Bourelle et al. Courtesy ‘140 Characters in These Streets‘ by Amy Lock. Amy’s summary of the chapter by Bourelle et al., I join the discipline’s pragmatic concern about labor practices and centralized decisions made about online instruction. I find myself concerned about ways my own institution centralizes curricular decisions and uses contingent faculty—and picture myself differently as a result. I am a node in the genre of the response, in the genre system of the assignment, in the activity system of the class, and of the boundary genre of English studies. I love being a part of this network.